You must be able to tick all three boxes below in order to qualify for caternity leave and pay. A false declaration of eligibility for Caternity Leave may be viewed as Gross Misconduct and subject to action under the Disciplinary Procedure. I nominate (* insert name *) as my primary provider of support at or around the time of my kitten’s adoption. Thank you to our doting mums and dads for sending us these lovely photos of their big babies! Eddy’s beautiful daughter Felina Fairytale, lives in her forever home along with Dr Who’s sonic screwdriver! She has learned to distribute herself equally around a table of role-players and not step on board games! I suspect she enjoys Klingon Opera and jellybabies, too. Polki retired to her forever pet family at the same time as all her kittens were early spayed and neutered. She is absolutely adored by her family, who spent months trying to get a picture of her sitting still!! She is still hyper-active, usually chasing her own tail, but when she pauses, Polki likes to be a princess on her very own flying carpet! Walking Back to Happiness being a magical flower-carpet princess! Valentine’s Day is the perfect day to celebrate the love and happiness that our beautiful boys find in their loving new families. When the time comes for our boys to retire,they get to select their new parents themselves, and, because they live as pets in our family, they adapt really well to their new homes. A*Flashpaws Limited Edition enjoying his new home! Another love story is Inky and Gaia. Gaia went to live with Inky a year after he left us. He was so overjoyed to see her, that he would not let anyone touch her but himself for her first 2 weeks. Their lucky mum describes Gaia as having completed Inky’s happiness. He was happy before, but there always seemed like something was missing. Now that he has Gaia to adore, Inky is the happiest boy in the world. The inimitable and world-famous Platina Luna’s Dragon Lance has retired and is quite plainly adored, as well as being much photographed! In the bath with Dragon! Look who got a little jumper for Christmas!! Faux fur and a life of luxury! 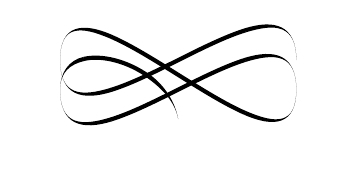 We have neutered Dragon and Dreamy, Harmony, Melusine and Quiet Flowers, and Walking Back to Happiness. Dragon, Dreamy, Harmony and Melusine have given us some wonderful babies, and have now been neutered and retired to their forever pet homes, where they are adored by their new parents. Quiet Flowers was spayed before having kittens and lives with her doting big brother in London. Walking Back to Happiness (Polki) was spayed after her first litter. All her kittens were early neutered at 12 weeks, and are beloved little pets. Polki’s wonderful family spoil her rotten! For pictures of them in their new homes, check out the Retired Gentlemen Page and the Retired Ladies Page! Double Grand Champion Talisker Harmony of Wychwood was born in Canada and bred by Amanda Bright. Here is a selection of our baby kittens who have all grown up now. Sweet little Ripples at 3 months old. Helmi Flick felt that the books were too ponderous for this little baby, so she got the biscuit tin! The culmination of Dragon’s show career was his photo-shoot by the supremely talented Helmi and Ken Flick, in May, 2013. 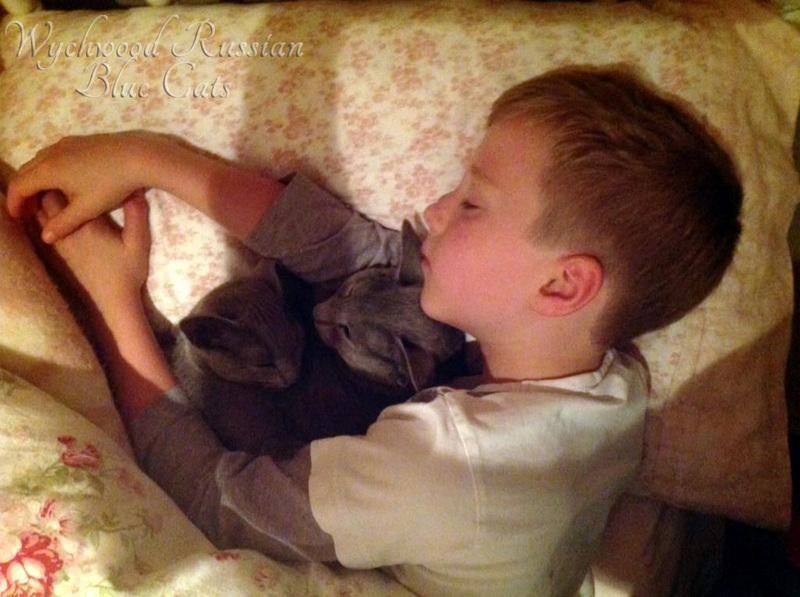 In four, short, UK shows, he garnered enough points to become TICA’s 3rd best International Russian Blue Adult Cat 2013. He also beat 300 other competing All Breed adult cats into the 8th Best All Breed Regional Winner position, whilst incidentally achieving Western Europe Region’s Best Russian Blue adult 2013. Not many cats reach this level of accolades after a year of showing, but to achieve it in four shows is something quite extraordinary. Dragon is the first cat owned by Wychwood to be awarded the coveted Supreme Grand Champion title, and is the third cat to reach the Regional Winner title under our ownership. All three of our Regional Winners have achieved their titles in four shows maximum. Aside from obvious bragging rights, what makes a cat so special, so extra-ordinary, that they do this well in such a small amount of time? Well in fact the upbringing of the cats is extremely important. Show training starts by picking up and examining the kittens, from birth. Cuddles, love, developing that special bond of trust and affection between owner and their show cat is critical to a cat performing in the show rings with confidence. The Russian Blue is notoriously difficult to show, according to many cat judges, because of their low tolerance to other cats in the show hall. In order to get any points at all, the judges must judge each cat according to how well it meets it’s standard. 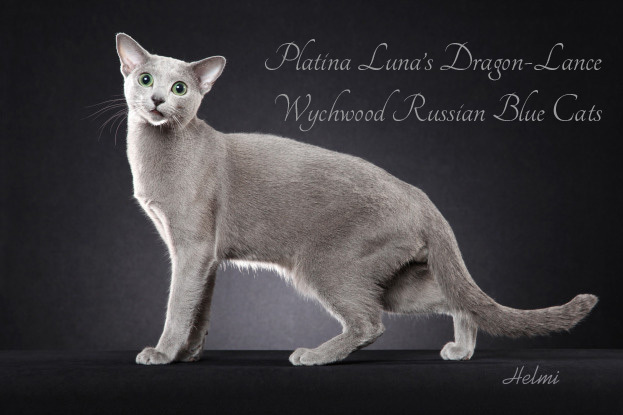 Dragon has all the right ingredients to please the judges, as he is exactly the type of Russian Blue that they are hoping to meet in the rings, but that is not often enough to really clock up the placements in judging ring finals, and attain the dizzy heights of Regional Winner. The top 20 Regional Winners are all cats who exceed their standards, and have something else. That extra sparkle, that “je-ne-sais-quoi’ that defines stars. Immaculate grooming is essential to presenting one’s self in one’s best possible light. Hygiene is a very important criteria, as is health. Cats displaying any form of illness or disease are not considered for the finals. Faults are also disqualifying. Here, judge Genevieve Basquine is checking for tail faults. Dragon’s relaxed stance on the judging table is a big feature of why the judges were happy to place him in their finals. Threatening behaviour is also disqualifying. All of these judging criteria are helping breeders to select the best cats for their breeding programmes: By only placing healthy, fault-free individuals, judges are constantly evaluating cat breeds, and they also ensure that relaxed temperaments are rewarded by placements, over stressed, or aggressive cats. Achieving a Best in Show is always exhilarating, but it is also a necessary step towards that elusive Supreme title. We are thankful to judge Valerie Davidson for placing Dragon Best in her ring after he had obtained his Quadruple Grand Champion title. -To become a Supreme, a cat must then obtain a single Best in Ring after becoming a Quad. It is easy to see his relaxed, inquisitive nature in the photo above. The show hall is only one side of the show experience, for cats, and their attitude towards travel and hotels can make or break a successful career. 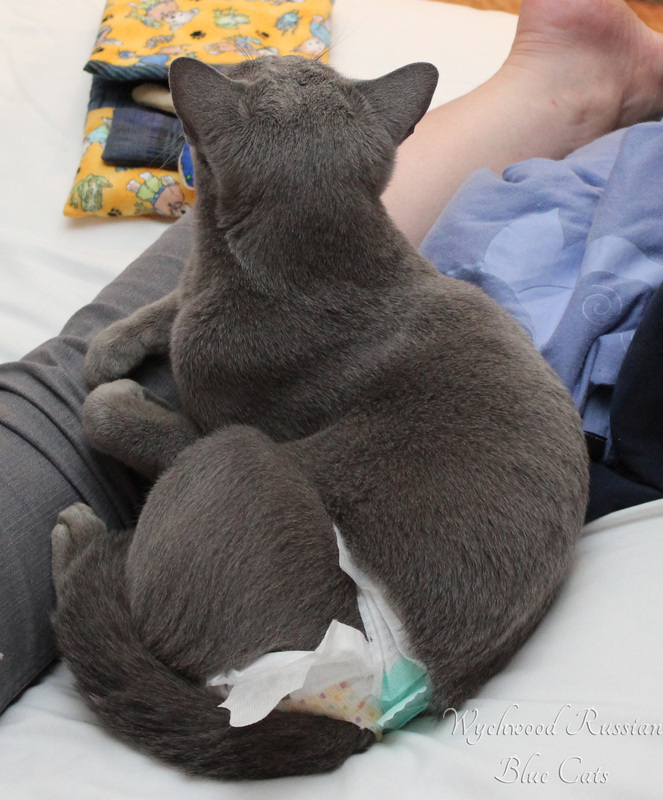 Dragon had to wear nappies in order to protect the furnishings in the hotel room, as an older stud male. In this photo, he had just become a father to his first litter, and therefore had begun to mark his territory and become more hormonal and dominant in his attitude towards other males in the show hall. It is most difficult to successfully show an entire male cat, because they do not appreciate the proximity of other males and can mark or get stroppy as a result or maturity. In our experience, Dragon adores travel and hotel rooms. He is relaxed and content to wear a nappy and just uses his time in the hotel to cuddle me. Dragon won more than a few judges over with his ability to seek comfort in their arms and to either purr or cuddle up to them like this. When he is either confused or nervous, he licks the tip of my nose, which is very endearing, and also shows an affectionate, gentle nature. All of these features, when combined with the special up-bringing by Michele Vischi, of BluEudemonia cattery in Italy, creates an outstandingly sweet tempered cat who is bomb-proof and wows not just with his wonderful conformation to type and standard, but also with an affectionate, laid back temperament. There are surely as many reasons for breeding as there are breeders around the world. Some do it for the money, they cut corners on the quality of life of their animals in order to maximise their profit margins. Others do it because they love bringing beautiful kittens into the world, and some of those do not bother to think about over-population issues in the cross-breed or moggie populations. Yet some breed for fame, by showing and winning titles for their cats and cattery and gaining the respect of other competitors. Quite a few breeders enjoy the social side of breeding. -Belonging to a social network of other like-minded people who breed pedigree kittens, who they meet in the show halls around the world, to chat about lines, pedigrees, health issues and sharing their lives with breeding animals and their offspring. Whilst Wychwood pride ourselves on our show bench accomplishments, and we now have established our own cat club within The International Cat Association (TICA) in order to host cat shows of our very own, we have discovered that we are part of a very select group of breeders who do it for love. There are many different types of love that a breeder can express. Our first love is for cats. All cats, regardless of type, pedigree (or lack thereof) and background, are loveable in our eyes. They all share that feline “je ne sais quoi” that makes us stop and stroke a cat in the street for the sheer pleasure of sharing that privileged moment “à deux”. The second love, which is necessary in order to be counted amongst the “Good” breeders of this world, is a love of the breed. Breeding is a passion, and it rapidly becomes all-consuming. Conversations tend to centre around pedigrees, breeding lines, and friendships are forged around matings, kittens and breeding cats. Holidays become centered around other cat breeders and acquiring genetic diversity. Feline pedigrees tend to also mirror relationships between humans. Those who share certain lines, are related via beloved cats. Parents of kittens are cherished and likewise, the passing of elderly cats who have contributed to lines and pedigrees are mourned internationally by all those whose kittens live on through that cat. Cats create ties that bind and create community. Some breeders will only work with specific lines, and others will avoid them, but most breeders will embrace friendships within their own breed group, and cats will travel around the world. Social media has been embraced by certain breed groups, creating even more binding ties and links around the world, as breeders enlarge their social circles to embrace new friends and add to their feline families. This is all for the good of the genetic diversity of breeds, as breeders blend lines and widen their gene pool across most continents. As an example, there are Russian Blue Breeders on six of the seven continents, and Facebook ensures that everyone knows of each other and/or have links with other Russian Blue breeders around the world, in some way or another. Clearly the love of cats creates links. It has been said before that cat-worshippers are geeky internet-lovers! Dog lovers meet in in parks and go for sociable walks, but us cat lovers are left with nowhere to express our devotion to our pets, and so have taken the internet by storm. Facebook, Twitter, Tumbler and other internet-based social media all help like-minded cat lovers to reach out to each other. At Wychwood, the Wychwood Family is another example of how cats create ties, and the Wychwood Family is a very central reason to our breeding programme. Each kitten goes to a family that we hand-pick, amongst all of our enquirers. We love our families. They are genuinely lovely people, who open their hearts and their arms to our little babies and love them and cherish them for their whole lives. -What is there not to love? Cats seem to create culture. Whether pop-culture or academic culture, the result is similar. There is a sense of belonging, of being able to group with like-minded others who love cats. There is always something to share, something to relate to and sympathise with or something to chat about. New kitten owners find themselves overwhelmed by the positive response that they get within their own communities, once they open up and share the passion that they have for their new arrival, or soon-to arrive kitten. Once of our kitten mums had her soon-to-arrive kitten as her screen-saver at work, and to her surprise someone recognised the little one as a Wychwood simply because they knew another Wychwood mum socially. The chances are slim to nil of this happening, but there was an instant bond created between both mums, and they then kept abreast of each other’s cats. Instant family, just add kittens! I delight in the social aspect of breeding, and I very much feel that if it takes a village to raise a child, then it takes a community to be an effective breeder.